We were asked to dream of someone we really truly love. We were asked to envision their life and all that we wish for their happiness. 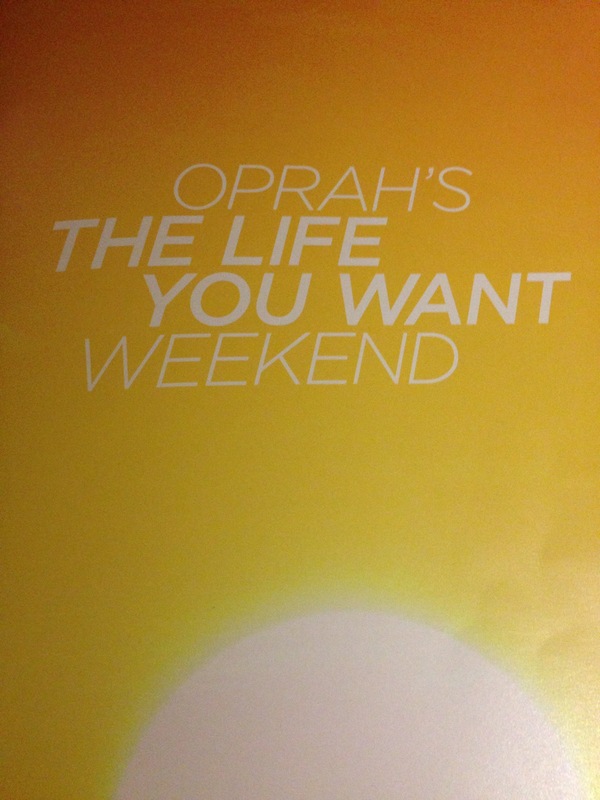 Oprah walked us through the visualization of all the things we could imagine for this person and we were asked to write everything down in our workbook. She wanted us to see where they lived, what they did, what kind of car they drove, what kind of house they would live in. She wanted us to see goodness for this person. After we wrote for awhile, she walked around the stadium looking over shoulders and invited a couple people up on stage to share their story. As people shared their hopes and dreams for their loved ones, she asked us what we thought the intention was. She revealed that what we wished for our loved one was what we wished for ourselves. She wants us to think highly of ourselves and to dream BIG! Part 2 was designed to see our life today. There was an A, B, and C part to this exercise. In part a, we were asked to think about all the areas of our life today and she presented us a list. We were to circle the ones that were the most important ingredients for the life we want and there were spaces to add our own ideas. Her list included friendship, body/health/well-being, Occupation – inside or outside the home, hobbies and passion, financial situation, home, spouse/mate/partner, family/children/grandchildren/parents, contribution to the world, and spirituality/faith/beliefs. There was then a circle in the middle of the page that represented our life circle. We were to divide it into slices based on the areas we chose from the list above. Big slices meant that they were very important to us. Small slices were less important. My circle had “Here I Am” in the center circle and all the areas of my life that were important, spiraled around my heart center. I didn’t quite follow directions as this depicted my reality more than the slices. After we divided up the pie, we were to mark each slice based on how we felt about that area with a happy face, representing good feelings, a straight face which represented so-so feelings, and a sad face that represented bad feelings. This represented our life circle. “Having the best things is no substitute for having the best life. The last part was about creating a new vision. In this section was a checkerboard with images and phrases. Step 1 in creating a new vision was to choose the language we choose to speak to ourselves. If we say, “I’m tired.”, we will be tired. If we choose, “I choose happiness.”. then we are on our way to experience happiness. To tell a new story starts with changing our language and she wanted us to be aware of the words we choose to describe how we feel about ourselves. We were to cross out the language we wanted to stop using and to circle the words and ideas we wanted to use more often. We didn’t finish step 2, but that part was to help us capture our new vision. We were to think about what we wished for originally in our life in Part 1 and then reflect on the life circle we want to build. And finally we were to use our new language to write down a vision for ourself living the life we want. What life do you envision for yourself? I hope your dreams come true.